See the best of San Francisco by combining a helicopter flight above the spectacular cityscape with a tour of one of its top landmarks. Spend up to 20 minutes soaring over the city and bay, admiring the Embarcadero, Angel Island, the Transamerica Pyramid, the Golden Gate Bridge, Sausalito, and other attractions. Then take a ferry out to Alcatraz to explore the infamous prison with its award-winning audio tour. This tour can be completed over two days. Choose from three different flight times with pickup from two locations. The Alcatraz portion of this tour can be taken on the same day as the flight or the day after, depending on the selected departure time. If you decide to take the later afternoon helicopter flight, you must take the Alcatraz tour on the following day. Check the Important Info tab for more details. After pickup from either Union Square or Fisherman’s Wharf, your combo tour begins at the heliport, where you’ll board your 6-passenger Bell Jet helicopter, a comfortable chopper that provides a smooth ride above the City by the Bay. Your 15- to 20-minute flight provides you with amazing aerial views of the city’s famous sights and attractions: Alcatraz, Treasure Island, Angel Island, the Sausalito waterfront, the Transamerica Pyramid, the Financial District, the Ferry Building, Embarcadero, Coit Tower, the Bay Bridge, and the Golden Gate Bridge. While you marvel at the vistas, enjoy listening to a musical soundtrack and expert pilot commentary through your headset. Your adventure ends back at the heliport, from where you’ll be returned to either Union Square or Fisherman’s Wharf. 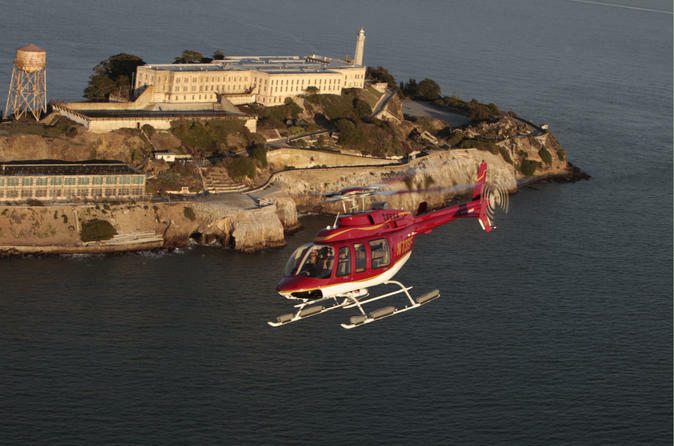 You may take the Alcatraz tour on the same day as the helicopter tour or on the following day — it’s your choice. The Alcatraz ferry departs from Pier 33 on the Embarcadero, which is an easy walk from Fisherman’s Wharf. Hop aboard and enjoy the ride across San Francisco Bay to the island, admiring views of the Golden Gate Bridge and city skyline along the way. The Alcatraz tour is independent and audio-guided; when you arrive, simply pick up your headset and begin your exploration of the historic prison. The award-winning Cellhouse audio tour provides fascinating commentary about life inside the world’s most notorious penitentiary. Walk inside a cell, see where prisoners ate and spent their time, and learn about the legendary criminals who ended up there. Leave the island at your leisure; ferries depart frequently to return you to Pier 33.